Syracuse will look to avoid a rare four game losing streak under Jim Boeheim when Duke visits the Dome on Wednesday. 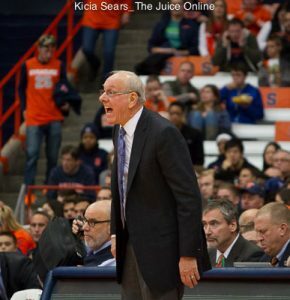 Item: A five game losing streak for Syracuse basketball? It’s never happened in 41 seasons under Jim Boeheim, and unless the Orange knocks off No. 10/11 Duke (22-5, 10-4) in front of 30,000 Dome crazies Wednesday night, or No. 6/7 Louisville (22-5, 10-4) at the always tough KFC Yum! Center in the next two games, the losing streak will reach five for the first time by late Sunday afternoon. What an unusal Syracuse basketball season this has been with no much pre-season promise, a pre-conference portion of the schedule to forget, low-lighted by the 33 point Dome loss to St. John’s in December, followed by ACC road struggles galore, until a mini-five game winning spurt highlighted by home wins over Florida State and Virginia, top ten teams at the time. Presently, a three game losing streak not only has put the Orange (16-12, 8-7) back on the uneven footing of the NCAA Tournament bubble, but each of the minimum of four games to play becomes a must-win with so many other teams, ACC and beyond, showcasing similar or slightly better resumes for the precious at-large bids. 1991-92 – Despite four consecutive February Big East defeats, the Orangemen were still ranked 22nd when Boston College came to the Dome. With current assistant coaches Mike Hopkins and Red Autry comprising the backcourt, along with fellow starters Lawrence Moten, David Johnson, and the late Conrad McRae, SU holds of the Eagles 76-70, led by Moten’s 18 points. 2001-02 – In a forgettable year prior to “that championship season,” Syracuse had a three game losing streak to end the regular season, then it was one and done in the Big East tournament falling to Villanova to extend the losing streak to four, ending up 20-11 overall, but relegated to the NIT. In the opening round game at the Dome against longtime upstate rival St. Bonaventure, Preston Shumpert scored 28 points in a 76-66 victory. 2005-06 – This was the closest the losing streak came to being extended to five games. 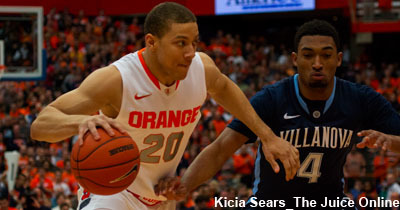 After dropping four straight late January Big East games, Syracuse also dropped out of the Top 25 poll as the Orange hosted Rutgers. 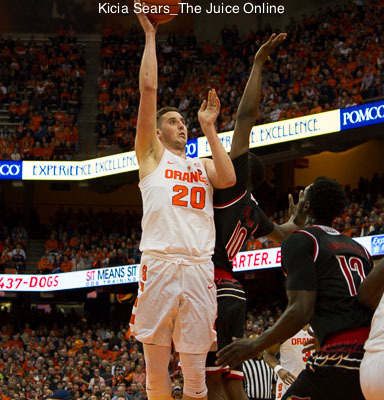 With current assistant coach Gerry McNamara (fighting a leg injury) and current assistant strength and conditioning coach Eric Devendorf comprising the backcourt, joined in the starting lineup by Mookie Watkins, Terrance Roberts and Demetris Nichols, SU snapped the losing streak in unlikely fashion. Down 84-83 with the ball in the waning seconds of overtime, Roberts, of all players, hit a three pointer from the top of the key at the OT buzzer to send everyone home happy, and relieved with an 86-84 win. 2010-11 – Dropping from third, to ninth, then to 17th in the polls following four straight January Big East losses, SU headed to Connecticut on a stormy winter day/night that dropped 10 inches of snow and ¾ inch of ice to the Hartford metro area. The weather didn’t detour the locals from practically filling the downtown XL Center, but they watched an Orange team that hadn’t won in over two weeks playing with a sense of urgency from the opening tip. Brandon Triche had 16 points and Rick Jackson contributed 13 points and 13 rebounds in a 66-58 win over the UConn team that would go on to win the national championship. As recently as the 2014-15 NCAA probation season could have had a potential five game losing streak had the ’Cuse not upset No. 9 Notre Dame in the fourth-to-last game of that year. After losing to Pitt, SU knocked off the Irish in South Bend, then dropped games to Duke, Virginia and the season finale at North Carolina State. So when a Top Ten Duke team arrives at the Dome Wednesday (7:00 p.m. ET / ESPN), they’ll be plenty of noise to help support the home team avoid just the fifth losing streak to reach four straight games during the Boeheim era.